Cupcakes 'n Daisies: Meet Monique . . . . 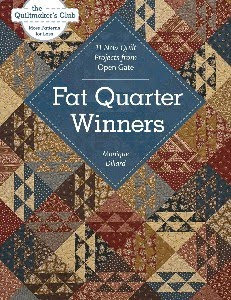 It's week three of the Fat Quarter Winners by Monique Dillard for C&T Publishing book tour! For this week's tour, Lisa, Nicole and I are asking Monique a few questions and sharing them with you. I'm curious by nature and love to ask questions, I'm a rapid fire questioner, I'll ask 3 questions in a row without giving the questionee time to answer question 1. I've even been told , "that's a nosey question"...really, I don't think I'm being nosey, I guess I just have one of those enquiring minds! Monique was great to answer all the questions I asked of her and if she thought I was nosey, she was polite enough not to mention it! Thelma's Nosey Question #1, " Monique, how did you come up with the name for your company, Open Gate?" Monique's Polite Reply, "Actually, my mom was the one who came up with the name. I really wanted to incorporate my Old English Sheepdog love into the name or logo and we tried everything. I had my friends and my family thinking of names. My mom called me one day and said: How about Open Gate. She said it's an inviting name because it implies that you want someone to come in to your yard. I liked it right away. Then I had a friend that is a graphic designer and she drew out a logo with the gate open and an Old English Sheepdog at the gate waiting for someone to come in, perfect!" I have to admit, before I even met Monique, I always looked for her patterns in quilt shops, it was the dog and that Open Gate logo that drew me in. Monique's Polite Reply, "My first pattern was published in 2004. I currently have 76 patterns. I have several favorite patterns. If I had to pinpoint a few, I would say: Courtyard (left), Dorchester Cottage (center), and Hidden Glory (right). Courtyard - I love the diamond effect that you get when you put your blocks together in Courtyard. Also, it has my favorite colors to use in quilts - red and black. Dorchester Cottage - The name reminds me of the countryside in England. I have visited England several times and it's one of my favorite places to go. Another reason is the color selection and the diamond effect that you get again when you put the sashing and blocks together. The pinks and browns are so warm and inviting and with the cream color background, it just sets it off. Hidden Glory - the main reason is that it is named after my dog that passed away. She was the sweetest, most loving dog that I have ever had. I miss her terribly. The other reason is that I love red, white and blue quilts and although this is scrappy, it's not overly scrappy. One of my favorite things about designing is the secondary designs that come out when you put blocks together. This is a prime example of that." Thelma's Nosey Questions #3 - "What patterns are your most popular patterns?" Monique's Polite Answer - "My most popular patterns are Quarter Scramble (left), Wine & Cheese (center) and Victoria Rose (left)"
Thelma's Nosey Question #4 - Since I can't live without my FTBG ruler, I would like to know what tool or tools you can't live without, also just how did you come up with the idea of the "Fit to be Geese" ruler, do you know how many are currently in use? Moniquie's Polite Answers - "Besides my rulers, of course :), I couldn't live without my 6" x 12" ruler. The reason is that I cut a lot of fat quarters and I can fold the fat quarter with the ruler fitting perfectly. I also have a scissor fetish. I love little scissors that snip threads and fabric. My favorites are Dovo so I don't have too many. They are quite expensive but wonderful scissors. " "My friend Sue and I were coming home from a retreat that I had been teaching at. I only had the Fit to be Square ruler at the time and the ladies at the retreat kept saying that I should design a flying geese ruler. So, I thought about it for a bit and on the way home, I bounced some ideas off of Sue and came up with the idea. Honestly, sometimes I don't know where the ideas come from. They just do and I'm glad!" "I would guess that there are over 4000 rulers out there. I don't know if that's a lot or not but they keep selling and I'm thrilled about it!" Thelma's Nosey Question #5 - I would love to know all about your sewing/design room and how you have it set up. Monique's Polite Answer - "Actually I have two sewing rooms. I have one in the basement that I had set up when I first started quilting before I started designing. That one is now used primarily for storage and cutting of fabric for kits. It has lots of light and shelves for patterns and fabric. It also has lots of tables for cutting and a huge ironing board. The one that I sew in now is upstairs on the main floor. We converted two small bedrooms into one large room and put sliding french doors between them. I usually have them open and use the whole space. I have a bed that I lay my blocks on when I'm piecing. I have a desk where I have my laptop and speakers for my I-tunes. I have a collapsible cutting table that my husband made. It is high and has a drawer. Most of my furniture needs to be collapsible so that when I have visitors, they have space. I also have a drop leg table where I put my sewing machine. There is a high shelving unit that my husband made for me and put a pressing board on top. I have a barn wood cabinet where I keep some of my fabric. In the small closet, I keep some more fabrics and one more tall cabinet houses my fat quarters. It's a wonderful space that I love to spend hours in." Thelma's Nosey Question #6 - What blog do you check first thing every morning because it's your all time most very favorite blog? Monique's Polite Answer - Oh that's easy, it's Cupcakes 'n Daisies! So what's a book tour without a giveaway? One lucky commenter from today's post will win Monique's Fat Quarter Winners book AND a set of her fabulous rulers "Fit To Be Geese", "Mini Fit To Be Geese" and "Fit To Be Square". 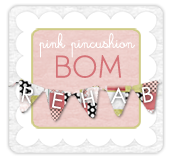 Just leave a comment on this giveaway blog, Nicole's giveaway blog, Monique's giveaway blog or Lisa's giveaway blog (Lisa's will be tomorrow), 4 chances to win, 4 winners, it's that easy. My giveaway closes on midnight Saturday, April 23rd, CST. I'll announce my winner on next week's book tour post. Yes, Crazy Eights is done, don't miss the big reveal next week. I can't believe you've finished Crazy Eights already - I'm looking forward to the big reveal! Thanks for a great blog interview with Monique, I love the story behind the name. I'd love to win the giveaway - thanks for the chance! WOW! I'm with Helen. I can't believe you're done already! 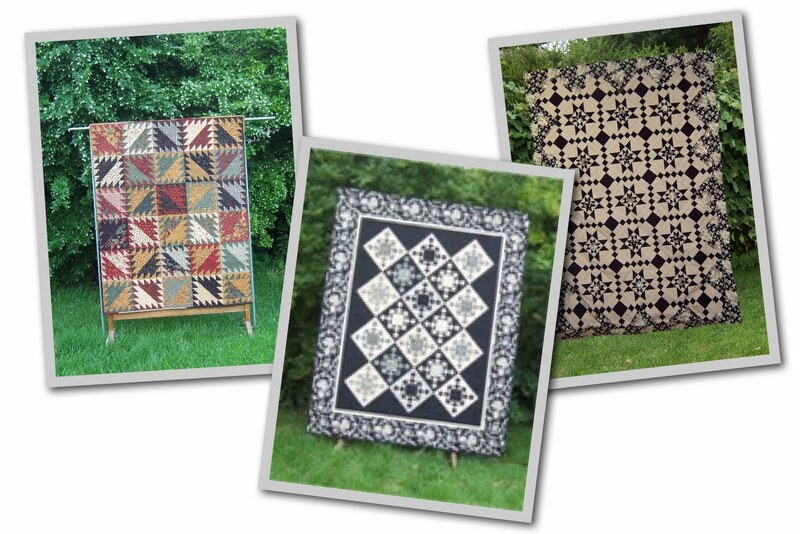 It's always interesting to me the difference between the designer's favorite quilts and the customer favorites. It's funny how they're usually never the same. Great Interview, Thelma! I have really enjoyed reading about Monique and getting to know her better. Kudos on the finish, Miss Speedy Gonzalez! You whizzed through that quilt!! I can't wait to see it! WOW your quilt is finished. Cant wait to see it. Please put me in for the Book and the rulers. They sound like a got to have. You're a great interviewer, Thelma! I've never used any of those rulers - so I'd love to win them. I'm a fool for labour-saving devices! Monique's pattern "Victoria Rose" is one of my favorite Open Gate patterns. Would love to have her book. There are several quilts in it that I'd love to make. Oh I love Monique's patterns and sewing room! I'm in the process of setting mine up and finding the cutting table is the hardest thing for me! :) Love your blog BTW. Can't wait to see Crazy Eights. You are fast! I do love Monique's patterns and I'm sure the book is great. Thank you for the opportunity to win. Hey nosey Thelma, great questions. The book and rulers are fabulous! I always love to see pictures of other quilter's sewing rooms. You can always find an idea that may work in your own space. Thanks for the chance to win. Looks like a book I would use over and over. Thanks for NOT making us jump through hoops to hopefully win Monique's great book and rulers. I'm sure Crazy Eights is a great quilt and I'm looking forward to seeing your version!!!! Can't wait to see the big reveal. I enjoy reading your blog. Have you ever thought of becoming talk show host. You would be amazing after reading your interview with Monique. I don't have any of these rulers. I'm not big on buying tools that I won't use regularly, but it sounds like I could get a lot of use out of that flying geese ruler! I so enjoy your sense of humour...you're such a good writer! Looking forward to the big reveal! Thanks for the nosey questions! I'm never brave enough to ask all the nosey questions so I'm glad you are! you are so efficient when it comes to cranking out blocks and they're so perfect! Learning alot through this tour about a designer I only had a passing familiarity with - very exciting stuff! Great interview and write-up, Thelma. Your blogs are so entertaining and it's what gets me going in the morning! Following this book tour makes me want the book and rulers even more. You girls have all done such a good job with this!! Thanks for the info, I am going to show my husband Monique's idea for a sewing room, two rooms divided by french doors. Owww, the wheels are spinning. Great interview, Thelma! Can't believe you have Crazy Eights done ..... do you sleep? Sure looking forward to seeing it! Monique's patterns are wonderful .... great instructions! I don't have any of Monique's rulers so it would be fun to win some. Great interview. 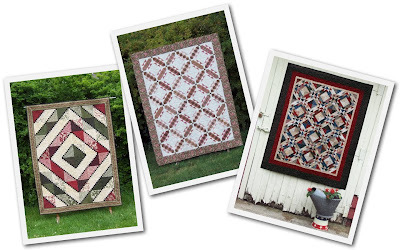 I love to hear about other quilter's lives, favorite things, etc. Thelma . . . I can't wait to see Crazy Eights . . . I love the blocks in the colors you chose . . .
terrific interview too . . .
Great interview...I would love to win the give away, because I am intrigued with the rulers...mind you the book looks wonderful too and a girl can never have too many pattern books. Fabulous interview - I had the pleasure of meeting Monique at the Chicago show 5 years ago and she's a delight. I can't wait to see your Crazy Eights. I love the colors. My neigbors would love it if I walked their dog! :) I've been lusting after the FTBS ruler since this Fat Quarter Winners tour began. Even if I don't win, one is coming to live with me! Thank you for the interview. It really is interesting to learn about Monique. I would love the chance to win this book. Thank you for the opportunity. My dog would be awfully jealous if I went to the neighbor's house for a walk companion. Loved your Nosey Questions--thanks for asking all the things we'd like to know! How could you do an interview and NOT be nosey? Your blog is great, so #6 could quite possibly be true! I'm enjoying the book tour, it looks like a good one! Wow what a great interview. I love the name Open Gate, it is so inviting. It's been fun getting to know Monique a little better. Thanks! Love the questions! Monique's book looks great and I am intrigued by the FTBG rulers! (Does walking my own dog count - my neighbor doesn't have one - LOL). Thanks for the giveaway chance! I've been a regular reader of yours for almost a year, but have never set up an account to be able to comment. This give-away seemed the perfect incentive! Your "nosey" questions were just fine and thank you so much for the interview. You are a fast quilt sewer! I wish I had more time to sew. I am intrigues by this book and would love to win it. Great nosy questions, Thelma! I loved Monique's polite answers, too!! No problem walking the neighbors border collie, but Twittering on FB? That's a new one to me - lol! Can't wait to see your finished quilt! Can't wait to see the big reveal. And I just love giveaways. Have a great day! Well, I don't have a dog, and neither do the neighbors. But...I DID feed their cat! And it's a cool 35 degrees out. Am so enjoying the interviews with Monique; it's great to get to know the person behind some of our favorite patterns, tools. I'm always in awe and amazement at creative people who think of something and go ahead and design it! Fabulous tools. Which neighbor's dog do you want me to walk? Next door is Sadie, a goldren retriever, and Tucker, a cocker spaniel. Sadie is a good walker, don't know about Tucker. Then across the street are Spirit and Serena, two Great Danes. Spirit played the part of Marmaduke in the recent movie! I doubt that neighbor would let her very large, very powerful, very expensive dogs go for a walk with a weakling like me. I think I will stick with my little bichon, Rosey. And instead of walking her, I think I will just open the back door and let her run in the (fenced) backyard! Monique is very polite in amswering. I love courtyard too! Glad you are nosey because it made for interesting Q's & A's. I really want a copy of this book so I'm hoping to be lucky! Looking forward to your 'reveal'! I'm waiting for a knock on my door, but for some reason the dog and I both know that won't be happening. I quess I have to do it myself. Please enter "us" into the drawing. Great blog and wonderful giveaway. I'd love a chance to win the book and rulers. Thanks for the chance. I love your blog and I would love a chance to win the book and rulers. Monique's sewing spaces sound awesome! Thanks for the chance to find out more about her with your nosey questions. Please enter me to win the book and rulers. My neighbour doesn't have a dog. I tried walking his cat but she looked rather confused and then decided she was having none of it. I'd love to enter the draw please - there are a few quilts in it I'd love to make, starting with Whist. I can't wait to see your quilt. Exciting! Been looking forward to getting this book since I first saw it. Would love to get a set of the rulers. I've been putting it off until I had a specific project for them, and I can't wait to start something from the book! does it count if my neighbor's dog walked himself into my yard and pooped? and do i get extra credit if i didn't yell at him? Loved your interview, especially about the sewing room. 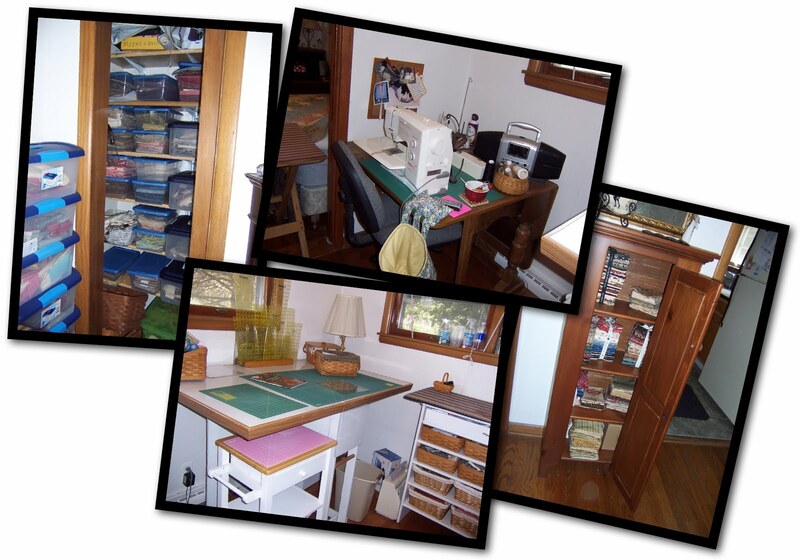 It is just fun to peek into other quilter's creative spaces! Very entertaining, yet informative interview!! It's so nice to get the designer's "inside" info! I check your blog every day! Would love to win (for once) the rulers and of course, a great new book using fat quarters. I really enjoy reading your blog. I'd love to see Monique's book and try out all her rulers. They sound fabulous. Wow, you're sooo fast! I can't wait to see your quilt either. Great interview, interesting to see what were her favorite patterns and 4,000 ruler, that's awesome! I enjoyed reading your "nosey" questions and Monique's answers. I am working on Quarter Scramble and my Victory Garden at this time. Would love to win the book and rulers. Love your blog! Can't wait for the reveal! Thanks for having a giveaway and asking all those questions! I really enjoyed reading the interview. I'm not one to ask a bunch of questions but sometimes I wish I was. That's how you find stuff out! Anyway, thanks for the chance to win. Your Crazy Eight blocks are gorgeous! Had to say that before putting my name in. :) Thanks! Can't wait to see your Crazy Eights put all together. Looks like the rulers really helped keep it precise. Thanks for the opportunity. Looks like a great book and one can't have too many. LOL Love the interview. I just HAVE to start making scrap quilts again in order to use up some of my stash. Your book or ruler would be a huge help to get me going! I can't wait to see the latest quilt revealed! A basketful of blocks? Can't wait to see them together! Monique's rulers sound fabulous and I've some admiring reviews. It would be fun to win and try them out. Oooh, those blocks look scrumptious, can't wait for the reveal! Wow! Would love to get those flying geese rulers! I'm new to your blog and I love your post! Very amusing! Thank you for the opportunity! Clever interview. I can't wait to get a set of rulers. Thanks for the info and the giveaway. Oh, thanks for that great giveaway! The rulers are what I´m really interessted in. Good interview! Thanks for the opportunity to win the book and rulers. I was able to purchase the small ruler and are really pleased with the results. However I've had trouble trying to purchase the large ruler. Might have more luck here! The quilts look really gorgeous and I'd like to make all the ones I've seen so far. Thanks again, love your blog. Really interesting interview. Fabulous book. Can't wait to see your Crazy Eights finish. 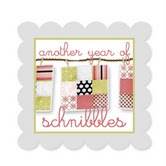 And thanks, always, for your ever-interesting blog, and your great quilt energy and accomplishments, and for sharing! I am so excited you finished that quilt already, can't wait to see it! and please tell me what kind of coffee do you drink!!!! I need some of that! What a great post! Loved it, and I hope I win the giveaway. I could use some inspiration! You are prolific. I'm looking forward to seeing your finished quilt. I would love to make Monique's Dorchester Cottage pattern - so pretty! OMG you're done! You're amazing! Great interview! Oooo - a chance for new rulers!! I love rulers but curiously haven't bought any for a long time. So mine are all dog-ears! Don't you hate when you do that? love your interview to Monique and the giveaway. The book is really cool! Thanks for a great interview. Monique has certainly designed some wonderful patterns. I would love to try out her rulers. I've heard from the great Carrie Nelson that the Fit to Be Geese is a must-have. Anyway, I certainly enjoyed your interview questions- esp. about Monique's favorite and most popular patterns! Would love to have all of those patterns...or even her new 'game' book! I'm also thinking her rulers are a 'must have' also! Gosh- I certainly hope I am a lucky winner in this blog give away!!!! I love the Open Gate logo and can't wait to see Crazy Eights! Great interview - I'd love to win the prizes and I've made a note to check out Monique's Courtyard pattern - I saw one very similar to it at a quilt registry I worked at this week and admired it - now I know where I can find the pattern. I haven't visited too often but will be sure to drop in from time to time to check up on your masterpieces. Enjoyed the interview with Monique. Very informative. Thanks for the opportunity to win this book and the rulers. Love the patterns I have seen so far on the different blogs. Wow I love your site, and the quilts are beautiful. I would love to speak like you. Hope to be able to follow, but can't figure that out yet either. I am new to blogging but not at quilting. I'm happy for a chance to win this great book and rulers. It was great to read the answers to your questions in the interview, and yes, they are what I would have asked too! loved your interview. I would love to win this book & rulers. Crazy Eights is fun! Way to go!